cabbage | Happiness is a warm oven. Posted on July 20, 2014 by Jenn C.
I have been pining over this recipe for years. Years. But I never wanted to attempt it until I tried it in a restaurant, so that I knew what I was aiming for. I could not wait any longer. And I’m so glad that this recipe is now in my repertoire. Here’s the recipe that I adapted from Serious Eats. Combine flour, dashi, eggs, cabbage, shrimp, scallions, and salt. This recipe makes two LARGE pancakes, so take half of the batter and fry it up. When it’s getting brown on the first side, add the raw bacon to the wet side. Flip, carefully, and brown bacon on second side. Cook longer than you think you need to and be careful not to burn it. Add the rest of the condiments to your taste when it’s done cooking. Notes: Next time I will make small pancakes to ensure even cooking. I am also excited to try different variations. The husband is allergic to shrimp–and he ate two today. He’s not feeling it. So I have to think of a replacement. Imitation crab? We’ll see. Posted on March 27, 2011 by Jenn C.
Let me be the first to admit: I know nothing about Indian cooking. Not one damn thing. And the term “Indian food” is pretty meaningless if you consider, according to Wikipedia, there are over 30 regional styles of cuisine in India. What someone cooks in Northern India is going to be completely different from what someone cooks in Southern India. So, as I peruse recipes, I feel completely lost–geographically and gastronomically. For your information, here is a list of the regional cuisines. The first and only time I ate real Indian food was at a friend’s wedding. Since then, I have timidly tried my hand at a couple recipes. Most have been disastrous. I made a recipe a few months ago, with garam masala, and even though I thought it was terrible, Jeff said he liked it and ate every last bite. I think my mistakes so far have been not really knowing what I’m aiming for, or what a dish is supposed to taste like before I make it. Knowing my shortcomings and being completely intimidated by the scope of Indian cuisine, I went ahead last night and made some Indian food. I got the recipes from Smitten Kitchen. I made a yellow dal, a shredded cabbage salad, and black-eyed peas in a spicy goan curry. The recipes were a little involved–but once I got the process down of cooking the pulses separately from the spices and vegetables, which need to be caramelized in their own pan, it got easier. So, the worst part is that these recipes were a several pot and pan operation. That being said, it was worth the mess and dishes to clean afterwards. Well worth it. With last nights’ successes under my belt, I plan to make a couple more dishes today. These Indian spiced potatoes look amazing. And I will also make a red lentil recipe from Madhur Jaffrey. The recipe is below. When the lentils cook, heat the oil in a 20 to 23 centimeter (8 to 9 inch) frying pan over medium heat. When hot, put in the cumin seeds. Let them sizzle for 3 to 4 seconds. Now put in the garlic. As soon as the garlic pieces begin to brown, put in the onion, cabbage and green chilies. Stir and fry the cabbage mixture for about 10 minutes or until it begins to brown and turn slightly crisp. Stir in 1/4 teaspoon of the salt. Turn off the heat under the frying pan. Posted on March 26, 2011 by Jenn C.
I am feeling completely uninspired on the cooking front these past couple days. I think this whole week has been uninspired. I spent my whole vacation waiting for my vacation to happen–and now, here I am: Saturday afternoon. I need to do chores, cook for the week, and do some lesson planning before school starts on Monday. Break is, effectively, over. The recipes I’ve decided to make this week come from, easily, one of my favorite blogs, Smitten Kitchen. This trio of Indian recipes looks really good. 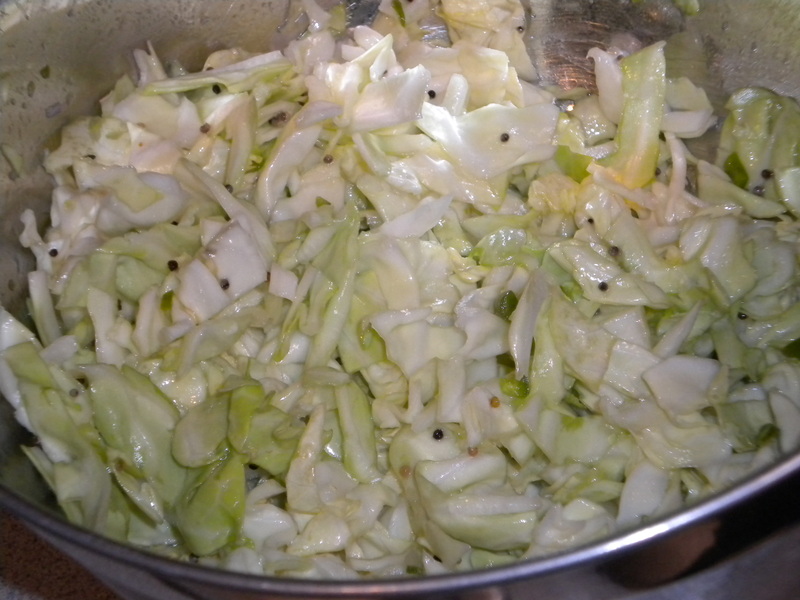 The first recipe is a sour cabbage salad that highlights lemon juice and whole mustard seeds. I’ve never bought or used mustard in its seed form, but it was cheap at my local supermarket, so I definitely won’t shy from it if it comes up again in recipes. The next is a simple, yellow daal–and if you recall, I need to use up my grains and legumes, so this recipe looks perfect for that purpose. Finally, I’ll make a black-eyed pea curry. I’m looking forward to moving towards a more vegetarian diet again, and I think these three recipes will be a good transition back into meat free meals. I also plan to make this bean salad, which is used as a sandwich filling. I think I’ll use a different type of beans instead of garbanzo beans, though, in this recipe. Garbanzo beans tend to taste like wet dog to me. P.S. I bought some kimchi from a local Asian foods market in Eugene. I think they make it on-site. I’ve never had it before. I’m pretty excited.